Evening turkey hunting can be difficult if you don’t know the right tactics to use. In this review, we’ll discuss the best tips for hunting turkeys in the evening and tricks you can use to become a better evening turkey hunter. The best time of day to hunt turkeys is in early or mid-morning, but evening turkey hunting can be productive if you know what to look for. Turkeys change their routine in the evening and you should modify your tactics to adapt to them. The best evening turkey hunting tips are to stay mobile, set up an intercept as they return to the roost, limit calling, stay patient, and use topography to your advantage. Below are the top tips for evening turkey hunting and what makes them so lethal. Evening turkeys are mobile birds that cover lots of ground. They are constantly on the move trying to find hens that haven’t been bred or moving between food and water sources. The number one tip for evening turkey hunting is to stay mobile and cover as much ground as you can to help locate where the birds are. I like to quietly sneak into areas and give a few clucks of the turkey call to see if there is any response. I usually call for 10 minutes and if there is no response in that time, move on to a new location and try it again. Sometimes the response can be immediate and an old tom will be on you in a matter of minutes. This is why it’s so important to properly set up prior to calling in the evening. Staying mobile means having a good turkey hunting vest that you can pack all your gear in. My vest can hold all my calls, decoys, shells, water, and snacks so I can keep everything with me and available should I need it. Cabela’s Tactical Tat’r 2 Turkey Vest – Great for Staying Mobile in the Field. Turkeys roost in mature trees such as Oaks, Cottonwoods, Pecans, and Pines. Roosting in trees allows turkeys to escape predators during the night and sleep uninterrupted. Knowing where the turkey roost is in the area you hunt can help you develop an evening hunting routine to intercept them as they leave or return. Turkeys leave the roost at day break and depending on the season; head off to find food, water, or a mate. The exact time turkeys leave the roost can vary, but it usually ranges from 6am to 7am. Unless disturbed, turkeys will roost in the same place every night so it’s easy to predict where they will be late in the evening. If you know where the turkeys are roosting, and where they go first thing in the morning you can develop a plan to intercept them in the evening between the two locations. This is the most popular turkey hunting method because it allows you to focus your efforts right where the turkeys are likely to be. Turkeys do gobble in the evening, but it’s significantly less than amount of activity that occurs in the early morning. Excessive calling in the evening can cause turkeys to keep their distance because it doesn’t sound natural. Turkeys are naturally more silent in the evenings since they most likely have completed their early morning strutting and breeding. Old toms can often be completely silent, but they will still respond to light calling. I like to limit my calling to the bare minimum unless a tom is directly responding to each of my clucks. Turkeys don’t often travel alone either. Toms and jakes tend to travel in groups of 2 to 4, while hens tend to be in larger groups of 3 to 15 birds. Mimicking the group volume with multiple callers is a trick I like to use when turkeys are in larger groups. Another tip is to use an owl or crow call to get turkeys to respond. There’s just something about each of these calls that turkeys just love to respond to. If you’re trying to locate turkeys in the evening, owl and crow calls make for a great locator calling trick. Nothing is more frustrating than picking up too early and having a turkey bust you that you never saw coming. Seeing as though turkeys can run up to 22 miles per hour and have been recorded in flight at 50 mph, the chances you’ll have a shot once they are spooked is slim to none. This scenario seems to happen more often during evening turkey hunting than anything other time of day. Staying mobile and trying to locate fast moving turkeys in the evening can lead to rushing and not fully giving each area time to develop. I’ve been guilty of it myself, and sometimes it’s just impossible to know that an old tom is headed your way if he never makes a sound. The best tip for avoiding this situation is to trust the area you’re hunting. If you’ve seen turkeys there before or it’s a good strutting location, it’s highly likely that turkeys are still in the area. If your first calling routine doesn’t get a response, wait 5 minutes and try again. But stay vigilant as quiet toms could approach from any direction. If you’re getting ready to leave, stand up slowly with your shotgun ready. You may be able to get a quick shot off on an old tom that you never saw coming. Topography is the natural and artificial features of the area you are hunting. This could be draws, vegetation lines, swales, ridges, or even mountains. 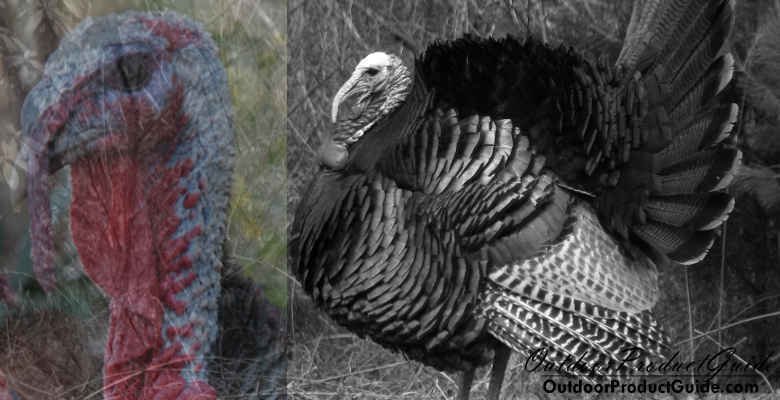 Abrupt topography changes can help funnel turkeys and pinpoint their location for evening hunts. The area I do most of my evening turkey hunting in is a mix of thick brush and open grasslands bordered by mature forest. I know the turkeys are roosting in the forest and making their way out along the thick brush lines while hopping into the open grasslands to strut and feed. Keying in on the thick brush they use to travel from field to field is the key to my evening hunting success. Another tactic that works well for hunting turkeys in the evening is to key in on creeks and drainages that help funnel birds. Turkeys are never very far from water and they love to hang out around shallow water streams that are slow moving. Being able to read and use the topographic relief that you have available can make your evening turkey hunts more successful. It can help narrow down large expanses of non-productive habitat and help you key in on where the turkeys are most likely to be. If you’re not using a turkey decoy, you may be missing out on a lot of opportunities to get gobblers in close during the evening. Let’s face it; the evening is toughest time to hunt these birds so you need everything on your side. A realistic decoy is one of them. My go-to turkey decoy for evening hunting is the Primos Gobstopper jake and hen combo. I like them because they look realistic and they are collapsible so I can carry them in my turkey hunting vest. If I get a tom to respond, I’ll set these out in front of my hide and it usually does the trick. I’ve harvested my largest turkey in the evening using these decoys and he even tried to attack them. Click here to check the current price at Amazon. 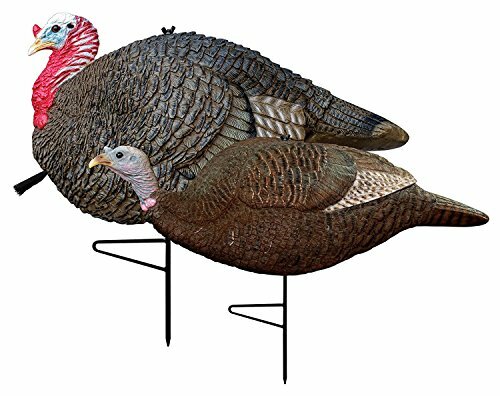 Turkey decoys are a great way to help divert a tom’s concentration away from where you are hiding and on to what he thinks may be a challenger or potential hen to mate with. Otherwise, the gobbler is pinpointing on your calling directly which can make even shouldering your shotgun difficult when he’s looking directly at you. What time do turkeys roost in the evening? Turkeys fly into roost just after sunset. The exact time they roost in the evening varies, but usually ranges anywhere from 6pm to 8pm depending on the time of year. Turkeys roost in mature trees and will continue to use the same tree unless disturbed. Some of the best turkey roosts are in and around small slow moving streams where turkeys can fly down at sunrise and get a quick drink before they continue with their daily activities. Keying in on where turkeys roost and the times they leave and return can make all the difference in developing tactics that work for intercepting them. Disturbing roosting turkeys can push them out of the area, so it’s best to avoid hunting too close to their roosting location. Need a new turkey choke? Check out our top picks here!